Guerilla Gardening at it’s finest. See the pretty flowers in that ordinary traffic island? 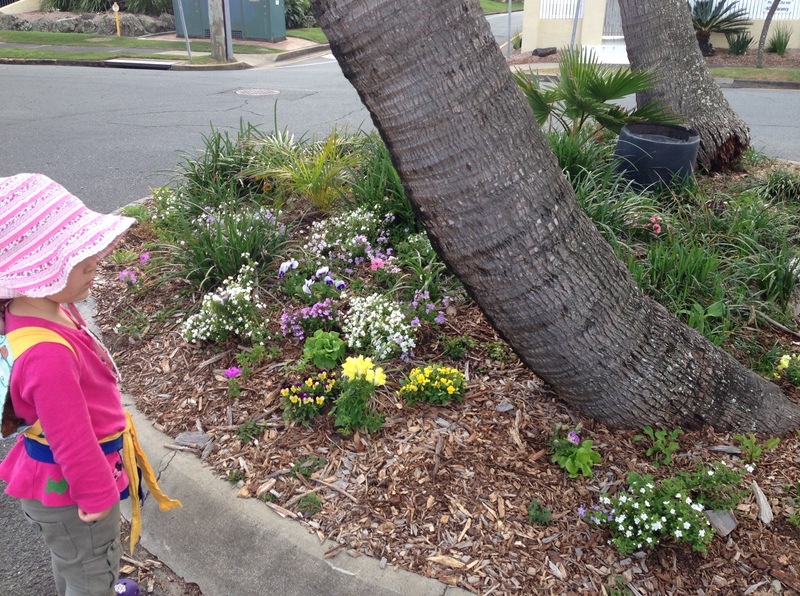 The Gold Coast city council has a few larger plants in there, but they didn’t plant those colourful things there… Nope, it was a local resident Kate M (not to be confused with me, Kate B), and her son. They bought a tray of dying plants from some gardening centre and brought them back to life, transforming this boring little piece of dirt into a vibrant little ‘guerilla garden’. My daughter (in the photo) helped plant a few of the plants herself, so she likes to think that it’s her garden too… and, well… it IS for everyone to enjoy! Posted in DIY, Eco Friendly Cleaning, Eco Living, Gardening, Sustainable Health and Beauty and tagged community gardens, container gardening, DIY container gardening, safe plastics to use for garden containers, styrofoam for gardening containers. Bookmark the permalink.